Ginger Fuji Apple is a tart, sweet Fuji Apple that takes advantage of spicy ginger to up the ante. Not your average scrub. 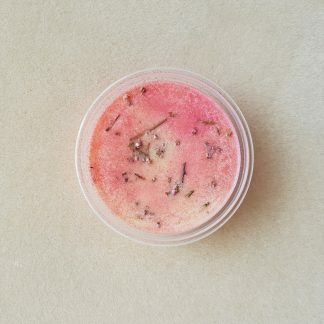 Different (and superior) to the common salt and oil scrubs, as this one turns into lotion when it comes into contact with water! This is all thanks to the magical emulsifying ingredients. Made with lashings of coconut oil and shea butter, and luxurious oils blended with fair trade cane sugar and poppy seeds to gently remove dead skin, leaving it silky and radiant. Your skin will feel so nourished, that there’s no need to apply moisturiser after. The goodness sinks in deep, so you can just rinse and go. Ingredients: Fair Trade Cane Sugar, Blue Poppy Seeds, Coconut Oil, Shea Butter, Sweet Almond Oil, Peach Kernel Oil, Grapeseed Oil, Macadamia Oil, Emulsifying Wax, Stearic Acid, Beeswax, Fragrance, Preservative (Phenoxyethanol), Colour, Cosmetic Glitter.